2. to make less active, vigourous, intense, etc. For some reason I thought that would be appropriate for this post, which is all about watermelon, which we’re all very familiar with. Most of the time we just eat things without giving it a second thought. Don’t worry, it’s not about world hunger today, nor is it about the dark side of food production. None of that sociological stuff. Rather, today we’re going a little deeper. Let’s get lost in chemistry. Ever wonder why people salt their watermelon? Or if you’re gawking a what you’ve just read, you should start doing it too. 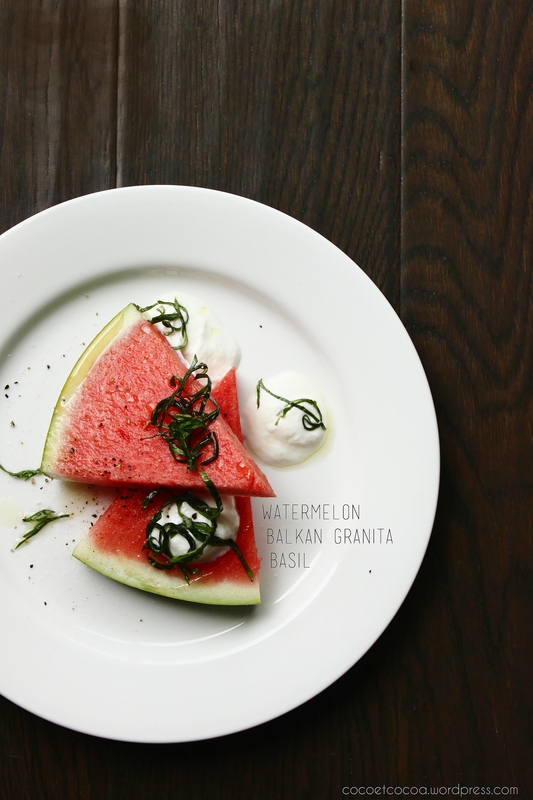 Well, aside from what I mentioned over last time, salt also makes your watermelon sweeter. In a spoonful, a light sprinkle of salt makes osmosis happen on the surface of the watermelon – the water inside the cells get “sucked out” in attempt to balance sodium concentrations in and outside of the cell. Blah blah blah, did I just lose you? 1. the drawn-out moisture that’s now sitting on the surface of your slice of watermelon makes it look more juicy and appetizing. You eat with your eyes first. 2. the moment you bite, the moisture is the first thing that comes in contact with your palate, so you’re tricked to thinking that it tastes juicier. 3. that moisture quickly leaves your palate, and you’re left with the slightly dehydrated watermelon, in other words, a mass of cells which are carrying a higher concentration of sugar. But of course all that’s just too much info, so let’s just get down to the noshing bit. Who needs knowledge? To make the balkan granita, place the yoghurt in a freezable container and place in the freezer for 30 minutes. Take it out, stir it, and freeze again for 30 minutes. Repeat until icy and set but still scoopable. So simple I can hardly take credit, but thank you!